Spotted Sea Trout occur along the southern U.S. Atlantic coast and in the Gulf of Mexico. These bluish-gray speckled fish are extremely popular with Southern anglers for both sport and food, especially in Florida. Flyfishermen go after sea trout because of this species' propensity to feed on shrimp in grassy areas of relatively shallow waters. Sea trout average 2 to 3 pounds but will reach 15 pounds. Striped Bass, which were the mainstay of saltwater surf, bay, and river fishermen along the north and mid-Atlantic coast for years, suffered from extensive commercial harvest in the 1960s and 70s and only now are making an amazing comeback thanks to season closures and stringent minimum-size laws. Flyfishermen have found a new quarry in stripers, given their tendency to prowl jetties, rock pilings, and other near-shore structures. Silvery white with black horizontal lines, stripers are strong fish and fight well, ranging from 5 to 10 pounds when young and more than 50 pounds when mature. Sailfish (detailed in the previous chapter) have become popular with more experienced saltwater fly anglers. Hooking them on a fly rod requires teamwork on an offshore boat, as a fish must be trolled up on a teaser, which is a hookless lure usually in the shape of a squid. The teaser is brought close to the boat, with the sailfish following it. The teaser is quickly pulled out of the water at the same time that the fly angler drops a big popping fly in that area, which the sailfishwith luckwill strike. Tarpon may be last alphabetically but rank first in the minds of many saltwater flyfishermen. 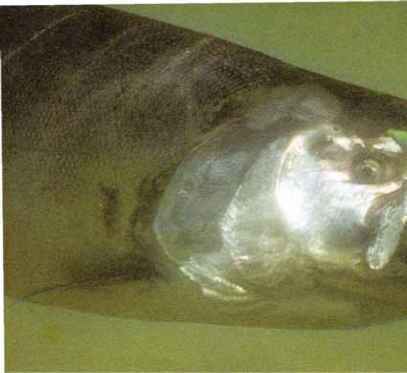 This is because tarpon are among the strongest of all saltwater species. They can grow to great sizes, with 200-plus-pound fish caught every year. And they often feed in relatively shallow waters, allowing you to search for and stalk fish from a flats boat. Just seeing a school of these huge creatures cruise and feed in shallow water is exciting. Approaching and casting to them without spooking the school, and then witnessing one of them come close to your fly and prepare to eat it can give you the shakes. If you manage to do everything right and actually hook it, that fish will probably jump completely out of the water and take off on a sizzling run, often emptying your spool of line and most of the backing, requiring you to chase the fish with the boat just so you can gain line back. Tarpon, sometimes referred to as silver kings for their coloration and their esteem by anglers, live in tropical and subtropical waters of the Atlantic Ocean, with many fish caught in Florida. Wherever you fish for them, it is not a sport for the faint-hearted. 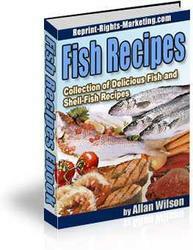 This is a great collection of delicious fish and shell fish recipes that you will love.